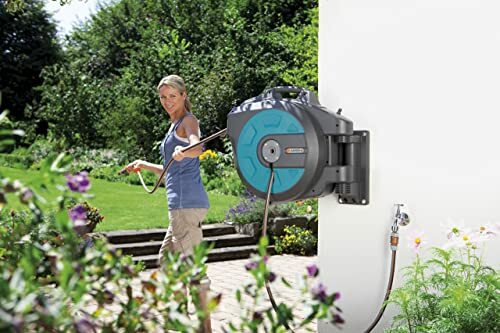 When considering which is the best garden hose reel there are a number of general factors you need to bear in mind, which I will discuss in full below – keep reading! When planning your flower beds or vegetable garden most gardeners will consider the soil type, environment and the species they can plant which will thrive in the conditions of the garden. The aim among other things is to minimize the need for watering. However, despite even the best planning most people throughout the world will at least need to water their garden during the summer. Now we need to ask who wants to water the garden with a watering can? 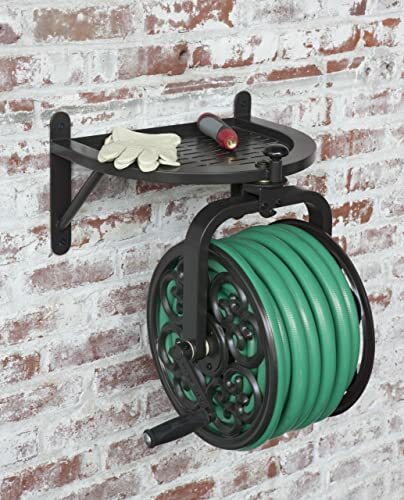 A garden hose is a “must have” accessory for all gardeners, but do you even need a garden hose reel? Is not the hose alone enough? Well, there are many benefits of using a reel. One benefit is the reel encourages and helps you to tidy away the hose and then protects the hose from lying in the sun receiving damage. Thus, the garden reel can help extend the longevity of your garden hose. A Reel That Includes a Hose or Doesn’t? Most reels will include a hose, and this is probably the best option if you don’t already have a garden hose. However, if you already have a hose you are happy with then there is no need to buy a reel with a hose included. There are many reel options, which don’t include a hose and this is a good way to save pennies if you already have a satisfactory hose. Tip: make sure to check the capacity of the empty hose reel and whether the hose you have will fit. When is A Hose Included How Long Should the Garden Hose Be? Most people will use their hose to water the garden or do outdoor tasks like washing the car. Now while a long hose sounds like a good idea, very often a very long hose can be a liability. When you are moving around watering the garden, the hose gets stuck and kinked, sending you running backward and forwards to unkink it. Not to mention the rather droll task of tidying the super long hose away when you are done. 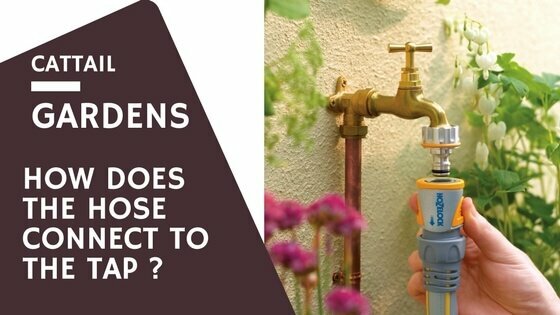 Ideally, you need to measure where the furthest point you need to apply water is, from where the hose will be located, and try to get the shortest hose to meet your need. Making sure to allow a few meters for a bit of giving. For example, if the furthest watering point from where your hose will be situated is 25 meters, then buying a 30-meter hose will be perfect. 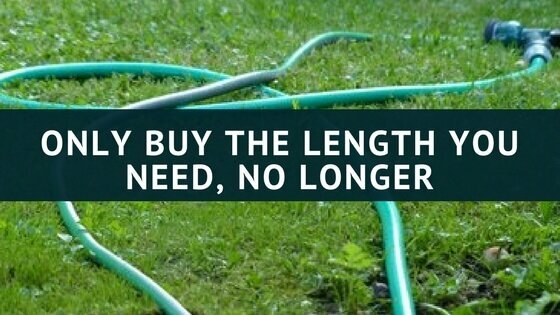 Don’t be tempted into buying a super long hose because it becomes difficult and heavy to manage. I would suggest no more than 50 meters at maximum, and ideally 30 meters or less. Then, if you really need a longer hose to reach your plants you could buy another shorter section of hose and join the two hoses together. In the long run, joining two short hoses together when needed is much easier to maneuver and manage. Another idea is to set up a soaker system with porous hoses in the plant beds, then you simply attach the garden hose to this system. In this case, only the nearest point of the watering system needs to be reached with the hose. This is a much more effective use of water as well because evaporation is reduced to a minimum. Wall Mounted or Free Standing? The wall mounted hose reels initially do look like a good option and certainly make the hose tidy when returned to the reel after use. 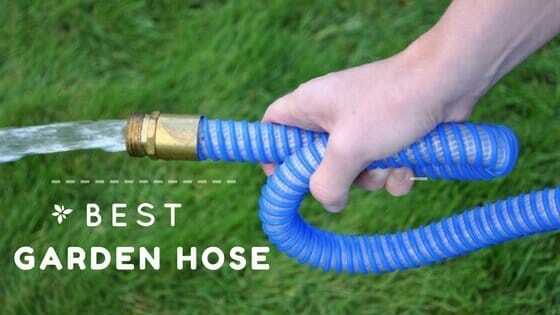 The benefits are having a convenient place to store the hose without taking up other valuable space in the garden. However, wall-mounted reels are vulnerable to damage because once water is in the hose this can be a lot of weight and strain placed on the reel. If you do go with a wall mounted hose reel then a high quality, the strong product is recommended. A good tip is to use more robust screws and wall fittings than those supplied. The advantage of a free-standing reel is flexibility, you can store the hose in different places according to your needs. You don’t have the hassle of trying to fix the reel to the wall, and the reel is under less pressure which should mean it lasts longer. Not to mention you can then spend less and still achieve longevity. Another benefit to free-standing reels is the fact you can take the hose inside in the winter which helps to prevent frost damage. The disadvantage of a free-standing reel is that it is more likely to get in the way if you don’t have a convenient place to keep it. Or they can fall over when you are winding the hose back in. Do hose reels have nifty design features you might ask? Well, they can and often they do. When choosing the best garden hose reel for you look out for innovative winding mechanisms, features built into the wall mounted reels (that negate some of their disadvantages), and other design features that can make the difference between a run of the mill reel and an exceptional reel. How Does the Hose Connect to the Tap? A very important factor to consider when choosing the best product for you is that not all connectors fit all taps. Have a look at your tap, and consider if your property is an old one or a new one. Older taps may have problems connecting with new products. Look at the stated measurements of the hose reel you buy and the measurements of your tap. In addition, when purchasing your product watch out for plastic connectors. They are notorious for breaking very quickly. When plastic is outside and exposed to all the elements it doesn’t take long to break down in the sun or even in the cold. All the best connectors are brass, and you should try to purchase a product with brass connectors. They will last much longer than the plastic ones. What Will You Use Your Product For? Most people will simply be watering plants, or washing the car with their garden hose. However, bear in mind if you plan to use the water for other jobs like the dog will drink from the pipe. Many pipes will leach chemicals into the water and if you have a pet who will drink from the hose you should consider a drinking water safe hose. Now when most people think of the design I can bet they are not going to consider garden hose reels! However, there is design involved and the design of your hose reel does matter. A lot of work goes into a garden, your garden is your living labor of love and the last thing you want is some brightly colored, hideous reel sticking out from your house wall, detracting from your house and garden. Style does matter so let’s go for products with a mute design that makes the garden the star of the show, not the bright colors of your garden reel! Your budget always needs to be considered when buying a product and when buying a garden hose reel there is no difference. Balance out cost and quality. Prioritise a good quality product as far as your budget allows because then the product you buy will last much longer in the end. If you are tight for money and already have a hose you can save money by purchasing a hose reel without a pipe. There are so many different garden hose reels on the market that it can be totally overwhelming to try to make a decision. I have chosen five excellent products to make your choice simpler. Below I have given details of the products I have chosen along with a summary of the product positives and negatives. This product is a good choice for anyone who already has a hose they are happy with and they simply want to tidy the hose up a bit! The large reel can fit up to 125 feet of a 5/8 inch hose. This means the majority of hoses are going to fit and there should be room for most hoses to wind into the reel without stuffing the frame too full. Another benefit of this product is it can be mounted on the wall and has a nice style to blend into the garden nicely. The winding handle is strong and made of metal; this makes the durability of the product promising. A useful tray is located at the top of the frame, handy for putting down your gloves and then being able to find them again! There is some work involved to fit the product to the wall. The hose reel includes a quality 25-meter hose in this case. The design and style look tidy and I think the product will look good in most gardens. Needs some work to fit the product to the wall. This garden hose reel has an elegant, unique design. 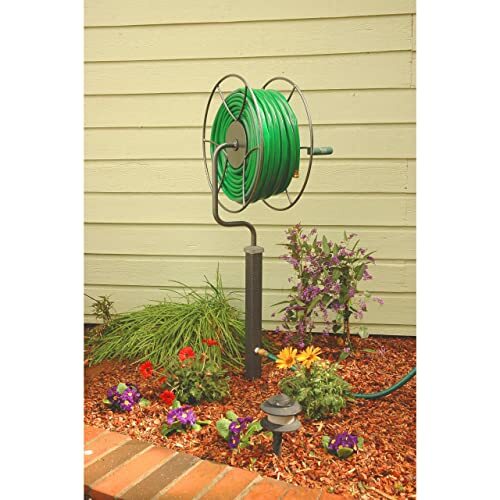 Anyone looking for a hose reel that will blend in well with their garden will do well with this product. The stand needs to be set into the ground with a DIY concrete base. Personally, I think making a concrete base is an easier DIY job than mounting something on the wall with a power drill and the need to make accurate measurements etc. 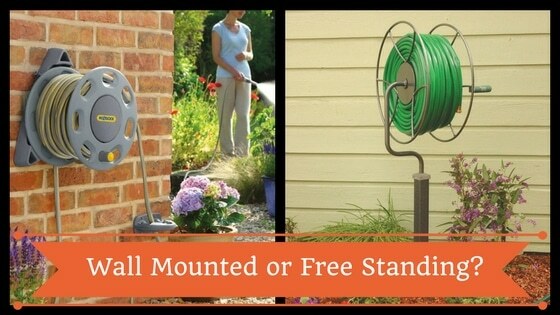 The reel can rotate 360 degrees so makes watering the garden and maneuvering the hose easy. The brass fittings to connect the hose and pipes are robust and I like the way the whole product is plastic free. There is a nice handle on the side of the wheel that provides easy winding when you want to tidy the hose away. The mechanism is manual but this does provide reassurance there aren’t lots of complicated parts to break easily. The product claims to fit 60 meters of 16mm hose pipe wound onto the reel. This may or may not be accurate but as I mentioned earlier in the article it is better to have multiple short hoses rather than one very long one anyway, so this reel should certainly fit a long enough hose for most people’s needs. This reel is not cheap, but for people who want to invest in a product that lasts, and a product that has style will find this reel a good choice. This is also a good choice for people with large garden’s because the reel does have the capacity for a long hose pipe if needed. A simple winding mechanism, for longevity. You remember I mentioned those nifty design features, well this product has some! 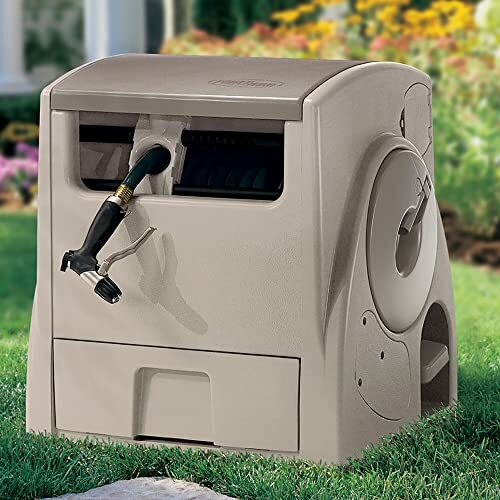 This product has a battery powered auto rewind set up and makes an excellent choice for people who don’t have the strength (or willpower) to wind the hose in manually. There is a handy foot pedal which is a great little design feature, along with a backup hand crank just in case. The unit has a useful compartment to store spare hose spray guns/ attachments or other kinds of small garden equipment you would like to keep handy. There is NO hose included but the unit can fit up to 100 feet of hose, which should be more than sufficient for most people’s needs without the hose getting too long and difficult to manage. If necessary a second hose can be purchased to join onto the primary hose to extend the reach. I am not so keen on the design somehow, it lacks finesse, but at least the color is mute and should blend into the background of your garden. A product for those with a medium/ high budget I think the price is very affordable for what it offers. You can take the hose down from the wall to take the reel indoors if needed. I’m not keen on the overall look/ style of the product! This garden reel from Hoselink is designed to be mounted on the wall, and is a nice fresh white color. I like the simple, tidy design and the mute color which is much better than bright tacky colours. I want my hose and hose reel to blend in not detract from and compete with my flowers! The reel comes with 82 feet of quality hose. Again for most people, this will be more than enough and if you need a longer hose, in any case, it is better to have a second hose to attach to the primary hose. There is an auto rewind system however, it is not an overcomplicated design so this gives confidence it will work for many years without problems. The fittings are all brass, which gives confidence the product is quality and will last. As an extra benefit, it comes with a 2-year warranty and 30-day money back guarantee. For those wanting a drinking safe hose then this product will make a good choice: the hose is BPA and lead-free. All in all the entire product looks robust, along with a competitive rate for quality, the product becomes very attractive! Competitive rate for quality product. 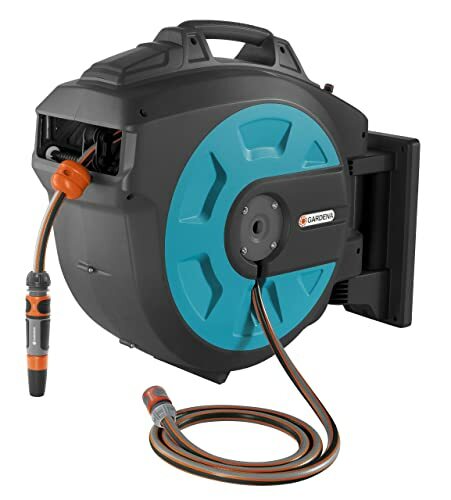 I am hard pressed to choose a favorite from the five products above but I think I would probably go for #2 the Gardena Comfort Automatic reel, because I really loathe winding up my garden hose manually, also because I have a lot of faith in Germany made products. 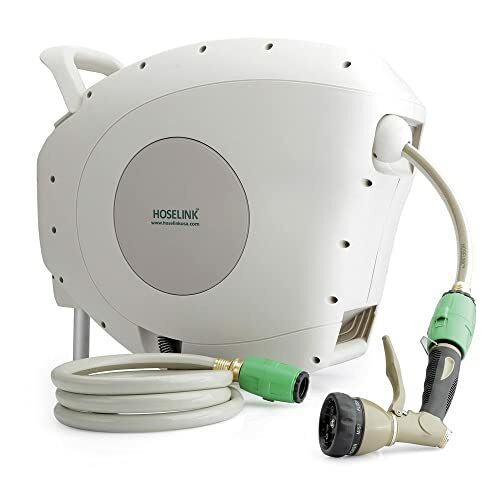 Or I would choose #5 the Hoselink product because I like the style and quality of the product. Which of my chosen five would you go for and why? Let us know in the comments section. In the end, I think there are a lot of fantastic products available on the market and people with any budget, and any specification will find something to suit them. Do you want to wall mount the product or keep it free standing? Do you prefer a manual winding mechanism or an automatic one? Do you want a reel that includes a hose or you have a hose already you want to fit the reel to? What style do you like and what will fit in well with your garden? I hope you have found my article and choice of products helpful. Should you have any questions please do let me know in the comments section!